The public reading of Poems for Shakespeare (part of the Shakespeare birthday celebrations presented by Mr Samuel Wanamaker assisted by Ms Maggie Southam) took place on April 26, 1975 in the retrochoir of Southwark Cathedral. The evening began and ended with Shakespeare settings by Robert Johnson, Sibelius, Thomas Morley, and Rodney Greenberg (the world premiere of his 'Helen's Blues' with words from All's Well . . .), all sung by Helen Sava accompanied on the lute by Michael Hunt and on the guitar by Kevin Peake. 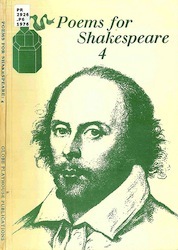 This was the fourth annual Poems for Shakespeare. It is a matter for rejoicing that such an event is thinkable at this time  that it takes place is a tribute to poetry, to Shakespeare's genius and to Sam Wanamaker's vision and seriousness of purpose. The 'commission of thy years and art' (to quote Romeo and Juliet) had involved (and I quote one variant of the letters I wrote to the poets) re-reading 'a Shakespeare play of your choice' and writing 'a poem out of that experience' (or in Sydney Carter's case a song). 'Naturally I am not asking for a direct response (unless you want that) but a poem of any kind that the re-reading inspires or suggests.' In addition to a poem, the poets were requested to select and read a passage from their chosen play  possibly a passage which connected in some way with the poem. I received poems from ten of the twelve poets who were listed in the programme. Two  in the end  were not able to come up with poems. One of the ten poets did not turn up on the evening of the 26th. After the interval, when her turn came to read, I asked if she was present. Not receiving an answer, I asked two members of the audience (whom I had primed during the interval), the actress Elaine Ives Cameron, and the poet Christopher Hampton, to read Veronica Forrest-Thomson's poem and Shakespeare extract respectively. I was worried and at the same time irritated, and I expected some explanation or reason, within a day or two, for her absence. The next day a friend and colleague of hers and mine telephoned to ask if I knew where she was: her parents had been in the audience he told me, and now, twenty-four hours later, still didn't know her whereabouts. Three days later he wrote to me to say that Veronica had died the day before the reading. She was 28. Tony Harrison, it would seem, was the other poet (besides Reed) who failed to produce a new poem before the event.